Its been around 2 weeks since my initial post on the "Puddle Garden", all the plants have grown fast and filled in very quickly within that time. 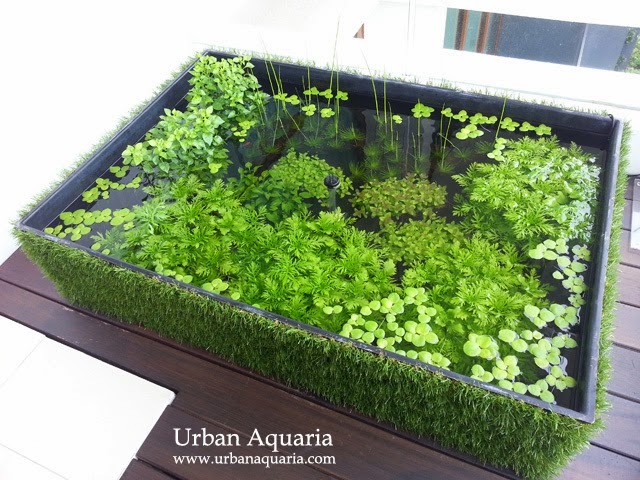 The Hygrophila Difformis and Ludwigia Repens bunches have grown so much that they now fill substantial sections of the base area. Bacopa Caroliniana have started to develop a reddish hue on its new leaves, most likely in response to ample sunlight. Limnobium Laevigatum (aka frogbits) keep growing fast enough that i have to remove a portion every few days, or else they'll start to cover too much of the surface and shade the other plants. Cyperus Haspan continue shooting long stems upwards, we'll have to see at which point they start to develop their characteristic emersed mop head of flowers. Got abit bored with not being able to observe much of the Boraras Brigittae, as they are very small and slim fishes, when viewed from above i could only seeing tiny shadows moving around, not very interesting... they are much nicer to view in an aquarium instead, so i shifted them back to my planted tanks. 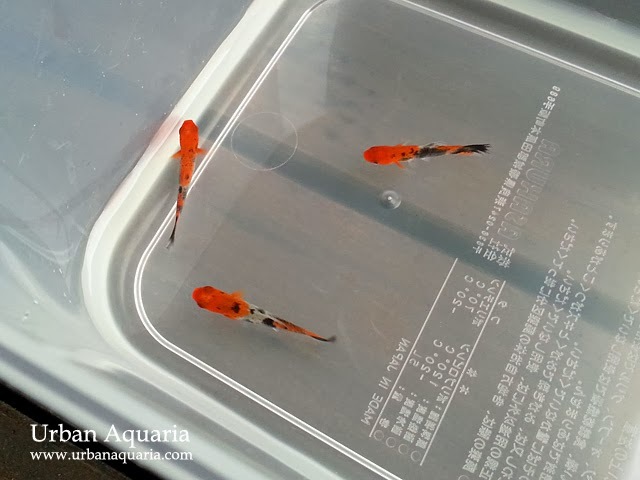 These fishes have vibrant colors with nice koi sanke style body patterns, and they look superb when viewed from above. 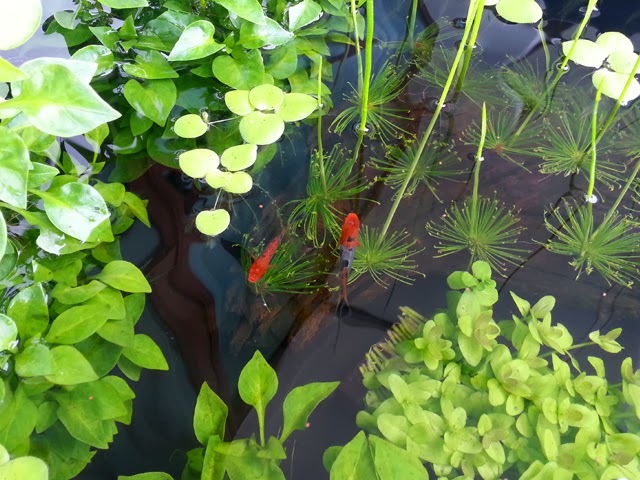 Due to their larger size (compared to Boraras Brigittae), i'll have to do more regular water changes to maintain water quality and hopefully the established dense plant mass can help handle and process the increased bio-load too. 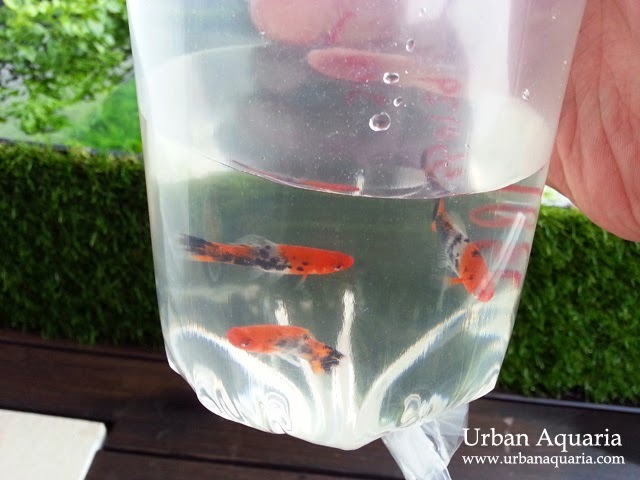 After an extended period of drip acclimatization, i introduced them into the container pond. Hi.... just wondering where to find this kind of fish also whether this fish will attack shrimps? These fishes will attack and eat shrimps. Where did you buy the plants ? I buy my plants from various LFS in Singapore... like Clementi Florist & Aquarium, Seaview, East Ocean Aquatic, OTF Aquarium Farm, Capricorn Plant Farm etc.